Gathering Shadows is a site responsive installation that responds to the changing cultural history of the Coal Loader, Waverton, from its indigenous heritage, land use on the site, its role in facilitating the coal mining industry through to its current role as a centre for sustainability on the harbour foreshore. The work considers our inter-dependence with site histories (indigenous, animal, geological) and the potential future consequences of our collective actions and inaction towards environmental ecologies. Notions of temporal flows, site ruptures and dis-ruptures, surface wounds and healing are investigated. The work explores clay as a media shaped by human touch and the ceramic traditions of containment. Unable to hold back their contents shells, small animal bones, charcoal and bricks flow and spill in the shadows of the ceramic forms. The Unfurling is a large scale site responsive installation of suspended body ‘voids’ created from recyled clothing and resin, harnessing wind and light. The work was exhibited as part of the North Sydney Art Prize 2015 at the Coal Loader Waverton. The site is located on the shores of Sydney harbour and examines the coast as a place of sanctuary. The Unfurling is a response to the debate surrounding vulnerable populations arriving on Australian shores and beyond, and the human costs. Individual rights and national interests are given precedence over collective human rights. Tragedy grips people dreaming of sanctuary but who are subjects to forces beyond their control through war, politics and discrimination. Clothing is utilised as a social and cultural signifier of identity, memory and psychological ties with others. The clothes become traces of the bodies that once occupied them, ‘voids’, and on mass symbolise the collective struggles of vulnerable people. Wind choreographs movement in the collective and subjects them to elemental forces beyond their control. The sculptures are translucent and reflect natural light as they move. The work was inpired by the poems of Mena Johnson, a poet that I collaborated with for the On Islands project at Eramboo Artist Environment. Groundswellis an energetic public art installation created for the ENLIVEN festival, Mona Vale. The work was commissioned by Pittwater Council and was made in partnership with the charity Lifeline. Made from donated recycled clothing Groundswellis a suspended installation made from pants of all shapes and sizes. Lots of legs appear to be surging forward, walking and running, and hopefully creating a ripple in the local community. Special thanks to Lifeline for their generous donation of clothing. A protective response to the fragility of the delicate ecosystem of Stony Range; captured, completely surrounded and held to ransom by the encroaching urban environment. 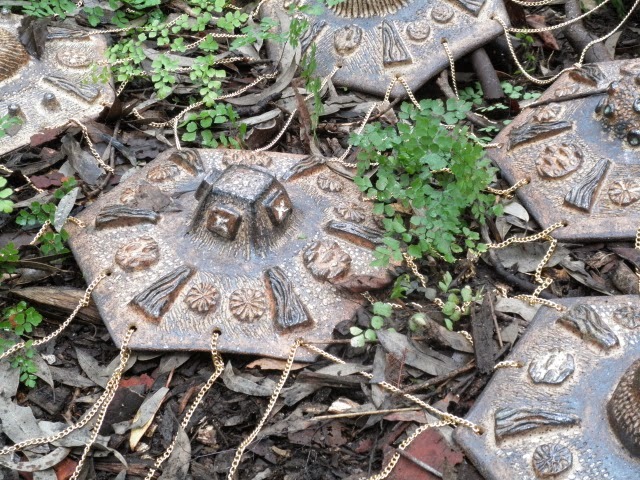 A site specific work installed in Stony Range Regional Botanical Garden 2014.